This article is a guest post from author and former WriteAtHome writing coach, David Sims. The series discusses the common characteristics of great stories in the vein of The Heroic Journey. Links to the rest of the series are below. One more word about the Hero in the Heroic Journey before we look at the nuts and bolts of writing one. Sometimes — often, in fact — in a Heroic Journey, the Hero wants something he’s too frightened to go after. Rose, at the beginning of the move Titanic, says she wants passion and adventure. Well, if she really wants that, as story consultant Michael Hague says, all she has to do is ditch her fiancé and her mother and walk along the docks of Liverpool in 1912. She’d find adventure alright. But she’s too afraid. Heroes can fool themselves about what they want at the beginning of a story because what they really want is too frightening. Or maybe they really can’t define this thing they long for. That’s when a want becomes a need — a piece missing. They’re not whole. They’re not complete. Clearly there’s some gap they need filled. It’s obvious. Just not to them. Shrek would say he’s fine at the beginning of the movie, but we see that because there’s no one in his life, he’s disconnected and lonely. This is because before the novel or movie began, the Hero has suffered a wound, a painful, unhealed injury of heart or soul. This wound produces fear in the Hero. It could be a traumatic distant event, or an ongoing situation. In Shrek it’s not revealed until well past the midpoint. “The world sees me coming, and they turn around and run.” That’s his wound, and it’s what he’s afraid of. So what we call “the character arc” is the Hero’s growth from woundedness to wholeness, from inner conflict to inner peace. In the beginning, the Hero is defined by others, external forces, or situations. 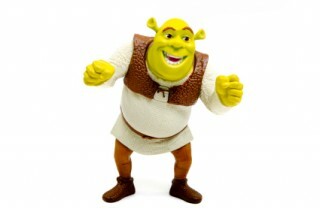 He’s generally manifesting this in a negative way – Shrek’s lonely due to his fear of rejection because he’s an ogre. Then, during the Journey, he gradually loses that. We see Shrek slowly opening up. He has a death and rebirth experience — when he reveals to Fiona that he’s an ogre, he’s essentially “killing” himself in front of her. After his rebirth (Fiona accepts him for who he really is), he draws on previously unknown or newly-acquired courage in facing down both outer threats and inner fears. By the end of the Journey, he can define himself. Shrek is comfortable being an ogre. He has moved from being trapped by his fears into living free from them. Frequently the Hero, in the beginning, constructs an identity to cover his wound. It’s whatever he’s attached to, how he defines himself to the world. But underneath that is the Hero’s essence — who he really, truly is. In Shrek he wears a suit of armor, a false front, to keep from showing Fiona his essence. Shrek can’t risk the princess finding out he’s an ogre. He justifies this by telling himself, I don’t have the problem, the world does. But to reach his goal, the Hero must show who he really is, without the false front. This point is a death and rebirth experience, where his identity dies and he’s reborn in his essence. Like our blog? Help us spread the word by sharing our articles on social media sites like Facebook, Twitter, Pinterest, and StumbleUpon. Feel free to post a link to this article or email it to your friends!